Remaining employment land at the former Maltby Colliery in Rotherham has been sized up by Ritchie Bros., the world's largest auctioneer of heavy equipment and trucks, for its new UK location. 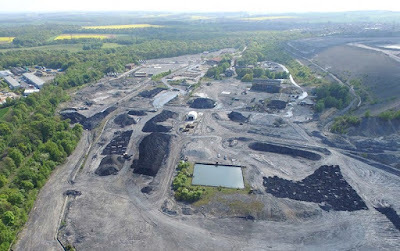 Rothbiz reported last year that Hargreaves Land was promoting the reuse of around 80 acres for commercial/industrial uses around the former pit head. Now plans have been submitted to enable part of the yard to be used as an auction site which could accommodate large plant, machinery and equipment when auction events would be held up to ten times per year. Around 575 attendees are expected at each auction event over two days. The initial proposals are for a smaller area for temporary period of 12 months with plans set to follow for the full 26 acres for a 20 year period. The first Rotherham auction has already been pencilled in for February 26 with a catalogue of loaders, dump trucks and excavators. Ritchie Bros. have been holding auctions since 1958, initially in Canada and then expanding to now operate on an international basis with over 40 sites. UK auctions had been held at Donington Park but have now outgrown the site. In searching for new sites, Ritchie Bros. identified two preferred sites and of these the land on part of the pit yard at the former Maltby Colliery was the preferred location. The plans added that "the former Maltby Colliery site's appeal to Ritchie Bros. included a heritage with an industry that they feel close to and a site with many inherent benefits by being expertly engineered and designed to accommodate large plant, machinery and equipment." Secure, controlled access and excellent transport links were also in Maltby's favour. The plans, drawn up by WYG, explain: "Ritchie Bros. employed 29 full time staff at their Donington Park site, which ceased activities in late 2018. It is anticipated that the temporary Auction Scheme would provide 30 full time jobs, which would include around ten employees relocating from the Donington Park site and the remaining 20 would be new employees. "It is envisaged that 40 additional temporary jobs would be provided for each auction event (over two days) up to ten times per year, along with a proportion of such jobs commencing the week before the auction and also during the following week. In addition, there would be indirect jobs and spend in the local economy associated with the Auction Scheme estimated to be in the order of £0.75m per annum." Transport assessments throughout the year are included with significant travel expected around the auction event days. 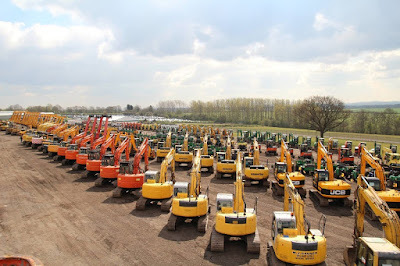 Rupert Craven, sales director UK & Ireland at Ritchie Bros., said: "We're extremely proud and excited to announce that we're holding our next UK auction at a new location: in Maltby, Rotherham (South Yorkshire). "More precisely, our auction site will be at the former Maltby Main Colliery mine – a place of incredible heritage and an inspirational community. As an active coal mine for more than a hundred years (between 1910 and 2013), it has seen its share of hard work, ingenuity and – yes – heavy machinery. We'll certainly strive to continue with these traditions. "We've started to outgrow our Donington Park site. More and more equipment is brought to our yard every year. Our new location in Maltby will be ready for future growth and offer more advantage to all our customers." The reclamation scheme for the rest of the colliery is expected to commence in Spring 2019. Images: Hargreaves / Ritchie Bros.